A lot has been said about Chinese naval modernization in recent years. However, China is not the only country that is currently investing in a modern naval force. Since 2011 Russia has been implementing its own naval modernization program. This comes after a period of neglect the as Russia Federal Navy (Russian Navy) is looking to build as many as a 100 new warships by 2020. 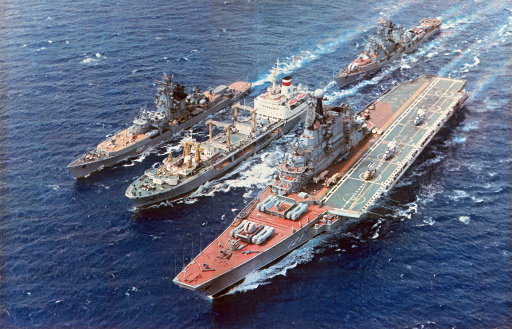 At the end of the Cold War in 1991, the Soviet Navy consisted of about 1000 warships from the smallest patrol craft and missile boats to the large helicopter and cruise missile-caring carriers. Indeed, during the Cold War, the Soviet Navy had an important strategic role in a potential hot war with the west. Besides being in charge of one of the legs of the nuclear triad in the form of submarine-launched ballistic missiles, the Navy was also expected to protect Soviet SSBNs, find and destroy Western SSBNs, and neutralize carrier groups. Where possible, the Navy was also expected to interrupt NATO sea lanes of communication and support ground forces in amphibious operations and other offensives. After the collapse of the Soviet Union and the end of the Cold War, the Soviet Navy was dissolved and reformed into the modern Russian Navy. After 1991, limited funding was available and as time passed, capabilities decreased, platforms retired, and construction programs were cut. The situation grew so bleak that in the mid-90s it was reported that the Russian Navy was unable to mount more than 10 deterrence patrols per year. This decline continued until 2002 when no patrol was conducted at all. Russian naval aviation suffered similarly and is still suffering from a lack of trained aircrews. In 2009 former commander of the Northern Fleet Admiral Vyacheslav Popov (ret.) stated the Russian Navy would experience a sharp decline in capability by 2015 unless current shipbuilding plans are grown and new vessels introduced. This situation persisted even after Vladimir Putin came to power. Whilst he advocated and funded large modernization programs for the Army and Air Force, the Navy did not benefit much initially. This remained the case until August 2000, when the Oscar-class submarine Kursk sunk with all hands in a disaster. In a sense, the tragedy represented the decline of the Navy and was a wakeup call for the Putin administration. Lack of discipline, shoddy, obsolete and poorly maintained equipment; negligence, incompetence, and mismanagement were all blamed by the investigation for the loss of the submarine. Since the unfortunate disaster, the Navy has enjoyed renewed attention and efforts have been made to modernize starting in the early 2000s and expected to run through the 2030s. Notwithstanding, the more pressing problem facing the Russian Navy today is shipbuilding capability and low build rate. The Russian Navy today is a very different force than its Soviet counterpart; this can be seen both in its structuring and its missions. The biggest challenge that the modern Russian Navy faces is the fact that it has fewer ships. The size of the Navy has shrunk to a quarter of its predecessor. Additionally, the ships of the Navy are divided between the five fleets (Northern, Pacific, Black Sea, Baltic and Caspian fleets) which operate in areas that are geographically separate. It is easy to envisage that the Russian Navy today cannot hope to compete with the sortie rate or activity levels that the Soviet Navy maintained. Despite this, its mission has remained similar to the Soviet Navy. Today, the Russian Navy is still expected to carry out the tasks its predecessor did. Firstly, the Russian Navy is still expected to maintain its deterrence patrols and the submarine-based part of the nuclear triad. Together with this, it must also provide protection for its SSBNs. During the Cold War, as missile range and accuracy increased, Soviet SSBNs did not venture further out at sea but instead stayed closer to home where they could be better protected by other naval assets. There is no reason to believe that this will change at least until more capable and silent submarines like the Borey-class become fully operational. It has been suggested that these boats might give Russia the capability to patrol the southern oceans, something that it has not done in 20 years. Secondly, and perhaps more significantly, the Russian Navy is expected to protect the Russian coastline. This means protecting from intrusions by any hostile power and making sure that Russia is not attacked from the sea. In this regard, the surface force has been particularly hard hit due to a number of shortcomings. Russia’s shipbuilding programs seem unable to meet the Navy’s demands. Beyond this, Russian shipyards are in need of modernization and rely heavily on foreign components for construction of Russian vessels. The sanctions imposed on Russia due to the Ukrainian Crisis have been particularly devastating both to the Navy and the shipbuilding industry. In particular, Ukraine has stopped selling ship engines to Russia, resulting in Russia having to find a substitute. The sanctions on Russia have also resulted in cuts to the Navy’s budget and orders for new ships. Thirdly, the Russian Navy is a tool through which Moscow will project its power worldwide. Again, in this area, the Russian Navy is somewhat lacking. Beyond its ballistic missile submarines the Navy has very little in the way of long-range power projection. These include Russia’s sole aircraft carrier, the Admiral Kuznetsov, Tu-95s patrol aircraft, and its forward naval base in Tartus, Syria. Deployments to the Atlantic and military adventurism off the coast of Syria are demonstrations of the Navy’s ability to project power. However, the Navy also recognizes that it is lacking in this department; various naval strategies since the 2000s have called for Russia to acquire between three to five aircraft carriers. Due to financial difficulties this order had to be cut to one. Despite the fact that the Navy has to cover various regions (Atlantic, Arctic, Pacific, Caspian Sea, Indian Ocean as well as the Antarctic), two areas in particular have seen more focus than the others, the Atlantic and Arctic regions. The Atlantic is seen as a potential battleground due to NATO expansion and renewed tensions with the West, whilst the Arctic is seen as a vital strategic region due to its untapped economic/resource value and its free access to both the Pacific and the Atlantic. Russian naval modernization has followed two main paths: extensively upgrading existing platforms and building new ones. Many of the old soviet-era platforms have been retired and those left in service have been extensively retrofitted to prolong their service lives. Despite tough economic times Russia has also managed to commission a number of new platforms. The main driving force behind these programs seems to be avoiding a situation where the Russian Navy would shrink to insignificance in the 2020s. The Kirov-class battlecruisers are an embodiment of this philosophy. Of the four nuclear battlecruisers constructed for the Soviet Union, two had to be scrapped because they fell into disrepair and were beyond saving, one is in active service (the Pyotr Velikiy) and the other (Admiral Nakhimov) is undergoing an extensive refit which includes upgrading anti-ship and anti-air weaponry before returning to the fleet in 2018. The Pyotr Velikiy will also be refitted and both battlecruisers are expected to be in service into the early 2020s. The aim is to prolong the service life of both ships until their replacement is in service. The expected replacement for the Kirov­-class is the 18,000 ton Project 23560E Shkval Lider-class (Leader-class in English). Equipped with the S-500 air defense system and P-800 supersonic anti-ship missiles it is envisioned to carry around 200 missiles of different types. The ship will likely be nuclear powered and will carry helicopters for anti-submarine operations. The propulsion system installed in the Lider-class will likely be used in prospective Russian aircraft carrier designs. Despite the unveiling of the project in July 2016, there are still doubts whether Russia is able to actually construct such a ship. The first ship is expected to be laid down in 2019 at the Severnaya Verf Shipyard in Saint Petersburg. A more conventional destroyer design, the Project 21956, is also under consideration to compliment the development of the Lider-class. A concept model of the Lider-class destroyer. The Russian Navy also has two new classes of frigate under construction, the Admiral Gorshkov-class (Project 22350) and the Admiral Grigorovich-class (Project 11356M). Both are intended to directly replace existing Soviet-era Sovremennyy-class destroyers and Krivak-class frigates in service with all Russian fleets and are equipped with the P-800 Oniks anti-ship missile system. However, construction has been particularly slow even by Russian standards; since 2006 only two Admiral Gorshkov-class frigates have reached the fleet and are still undergoing sea trials. Construction of the Admiral Grigorovich-class (started in 2014) fared somewhat better with two ships in active service and one in sea trials. The Russians also signed a contract with the Indian Navy for four Admiral Grigorovich-class frigates. However, both classes have been particularly hard hit by the crisis in Ukraine as the engines are imported from Zorya-Mashproekt in Ukraine. Russia is trying to find an indigenous replacement, but currently all ships under construction remain without engines. The Russian Navy is also acquiring a number of corvettes. The Buyan-class which come in two variants (Project 21630 and 21631, one armed with missiles and one not) for service with the Black Sea Fleet and Caspian Flotilla, and Steregushchiy-class, Gremyashchiy-class and the Karakurt-class corvettes. The Steregushchiy-class (Project 2038.0) was developed for littoral combat, the Gremyashchiy-class (Project 2038.5) are a larger variant with more endurance for longer missions. However, development of the Gremyashchiy-class was stopped after just two ships since the design depends on German engines, which Germany is now refusing to export in the wake of recent events. Instead, Russia has ordered more Steregushchiy-class corvettes of which it has six in service and five under construction. The Karakurt-class (Project 22800) is a blue water-capable design laid down in 2015 and four are under construction. They will be armed with P-800 medium-range anti-ship missiles and Kalibr-NK long-range cruise missiles. The first unit will be commissioned in 2017. For power projection purposes the Russian Navy is also looking to acquire aircraft carriers and amphibious ships (LHD). Information is scarce on both projects. Currently the Russian Navy operates no LHDs. 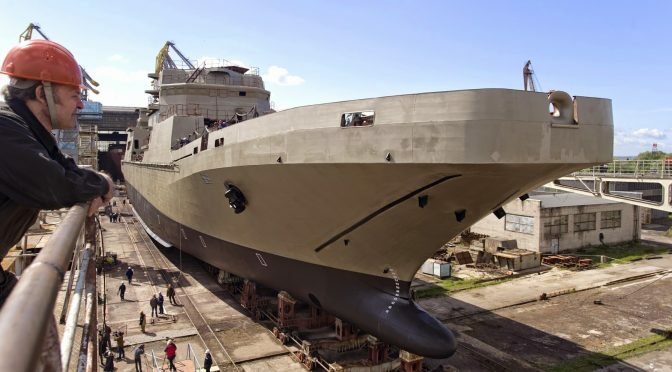 Its plans to acquire two Mistral-class LHDs from France fell through due to the conflict in Ukraine, and Russia is expected to start construction on an indigenous design before 2020. Plans for the construction of a large aircraft carrier were also unveiled in May 2015. The Project 23000E is a nuclear powered 100,000-ton carrier similar to the supercarriers currently in service with the U.S. Navy. However, it is still unclear whether financial considerations and shipbuilding capabilities will allow Russia to commission such a ship. Already, the number of envisioned aircraft carriers has been subsequently cut from one naval strategy to the next. At any rate, it will take Russia around ten years to build a new carrier and construction would start in 2025 at the earliest. Russia will still have to address its shortage of naval aviators. Things are progressing somewhat better on the submarine front. Russia has focused its efforts on two new classes of submarines, the Borey-class (Project 955) and the Yasen-class (Project 885). The Borey-class are SSBNs intended to replace the Delta III, Delta IV and Typhoon classes currently in active service. Russia currently has four Borey-class submarines in active service and seven in various stages of construction. Initial tests of the new SLBMs, the RSM-56 Bulava, were met with failure: 5 failures in 11 tests. The failures here were attributed to poor quality control and materials which resulted in delays in attaining operational capability. The first unit of the class deployed in 2014. The Yasen-class attack submarines are intended to replace the Soviet-era Akula and Oscar classes. 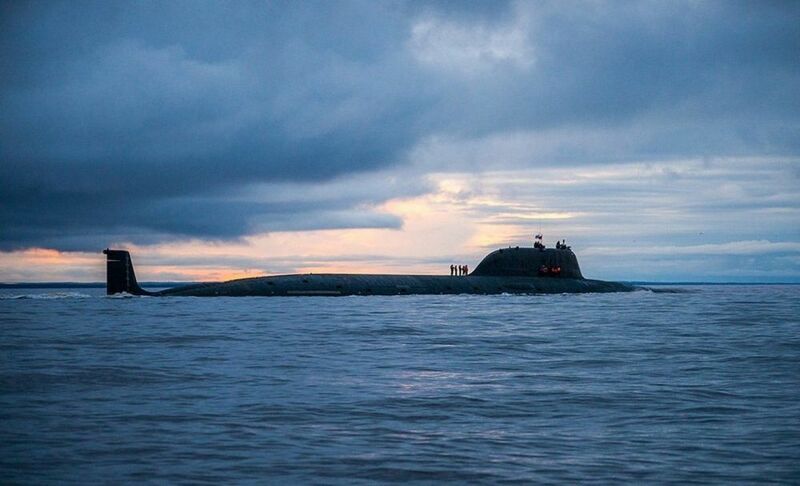 According to the U.S. Office of Naval Intelligence, these boats are the quietest submarines ever put into service by Russia, although not as quiet as contemporary U.S. Navy Seawolf and Virginia class subs. Despite this, they represent a giant leap in capability for the Russian Navy. Construction on the first unit of the class began in 1993 and was only completed in 2010 due to financial problems. The class is armed with torpedoes, long range anti-ship and anti-submarine missiles, and cruise missiles. The second unit of the class is estimated to cost US$3.5 billion making it one of the most expensive attack submarines ever commissioned. The high costs of each submarine has raised speculation that Russia might look for smaller, less well-armed alternatives in a bid to get more boats into service and drive costs down. The Russian naval modernization program aims to transform the Russian Navy from a Cold War-era fleet into a modern 21st century navy able to project Russian power abroad and defend the Russian coast. On paper the fleet that Russia is constructing seems formidable. However, there are still doubts whether Russia will be able to actually acquire all these new platforms in sufficient numbers. The reality is that Russia is operating in an unfavorable fiscal environment. Additionally, there are serious concerns whether the Russian shipbuilding industry can deliver in its current state, both with regards to the production of indigenous components for designs and the capacity to produce large ships. Unless these key deficits are addressed Russian naval ambitions will remain on paper. Steve Micallef graduated from the University of Malta with a B.A. (Hons) in International Relations in 2015. He also holds an MSc in Strategic Studies from the University of Aberdeen, Scotland. He currently works at Bugeja Geopolitical Consulting, Malta.